There are a number of reasons why so many Washington residents and visitors come to Steamboat Rock State Park time and time again. It is a 3,522 acre state park resting along the shoreline of Banks Lank. Not only are there campgrounds for overnight use, there are a number of other activities which can be enjoyed here. In order to have the best time, it is best to look into what is offered at the state park before going. There is no admission fee for visiting the park, so this is definitely enough of a reason to come and check out what the park has to offer. A lot of people come to this state park because of the different things it offers for families. Children will love coming and playing out on the grassy areas. During the summer, the park stays between 80 to 100 degrees. This is great news for those planning to come for a picnic of small get together. The lush grass is perfect for playing field sports and setting up a picnic, while there are also tables located nearby. Many people claim that this park is an oasis in the desert climate around it, making this a perfect place to escape to from time to time. One of the most appealing things about Steamboat Rock State Park is that it offers a large swimming area. Children love wading in the shallow water and escaping from the heat during the summer. Since the park is located on a gentle lake, there is no need to worry about the water being rough or dangerous to play in. There are boat launches as well, allowing individuals to bring along their boat and set out on the lake for a day of fun. Many people come to this park just to fish as well, since there are plenty of fish out in the lake to be caught. With the grills located nearby, an individual can catch a fish here and have it for dinner that night. Camping at Steamboat Rock State Park is a great way to really get a true appreciation for the beauty of this park. The campsite is first come, first served meaning that an individual will need to be there early in order to ensure they get a spot at the campground. There is a concession stand as well, allowing individuals to order simple food and even a nice latte. The campground features 26 tent spaces, 5 restrooms, 6 showers, 100 utility spaces, and there are even locations for boat-in campsites. The maximum site length is 50 feet, allowing plenty of room to set up tents and enjoy a nice time at the site. Along with the fishing, many people enjoy taking to kayaks on the water. These can be rented nearby the shore or brought in on a vehicle. Many people will ride out on the lake, scale up the rocks, and dive into the water below when it is deep enough. Not only is this very exhilarating, it is also the perfect way to enjoy being out in the water when the temperature rises. It is important to note that the state park has issues a launching permit for watercrafts, so it is crucial that one is sought out if an individual is bringing along their own boat. 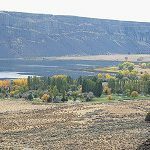 Due to how popular Steamboat Rock State Park is in Washington, it makes sense that an individual would need to make plans early in order to stay for a while. By planning ahead, an individual can set out to stay at one of the campsites for a maximum of 30 days. This is a great way to enjoy the summertime and have a memorable time with friends and family. With all of the activities this park offers, such as kayaking, fishing, field sports, and hiking, this is the perfect location to visit and it is very affordable as well for those on a budget.